Why Tableau Is The Best BI Tool ? Why Tableau is Considered the Best BI Tool ? The analytics field is dynamically growing each and every day and increasing difficulties for vendors to provide best and customized business intelligence tools. Till now, this industry was led by IBM, Oracle, and SAP etc. But, nowadays, along with rich set of features, Business Intelligence analytics wants efficiency and ease of use as well. In recent times, business needs more attractive, interactive, and agile tools to work with their real-time requirements. Tableau is one such leading business intelligence tools to grow the business rapidly and make it easy-to-comprehend by consumers and clients. It is easily deployable, highly scalable, and efficient performing framework. Due to all these features, it has become the leader for analytics field in this year’s Gartner Magic Quadrant. Since many years, this software tool is receiving appreciations from various large enterprises across the globe. Here, we will explore why Tableau is considered as the best BI tool. We will be covering below topics further. What makes Tableau best amongst all other BI tools? Embed dashboards within - We can use Tableau dashboards and include it in our webpage and also show it in different layouts based on its IFrame’s size. Share dashboards - We can share these dashboards with any user even if they don’t have Tableau Desktop at their end. Dashboards Commenting - Tableau supports dynamic commenting on dashboards which increases its usability and understanding. Patented technology from Stanford University - Tableau was brought by Stanford University with VizQL. It has changed working with data completely. Data notifications - Tableau supports data driven alerts in which if data crosses some important visualization mark, it will send an alert email to the respective users to address them. Mobile-supported dashboards - Tableau Mobile keeps your data at your fingertips. Toggle view and drag and drop - Tableau allows us to switch between different views in worksheets. In Tableau, everything we can just do with a drag and drop functionality. Filter and highlight data - Tableau allows usto drill down our visualization and color specific marks using variety of tools. Automatic updates - Tableau allows us to pause or reset the automatic updates while building a large view until we are finished with organizing data. 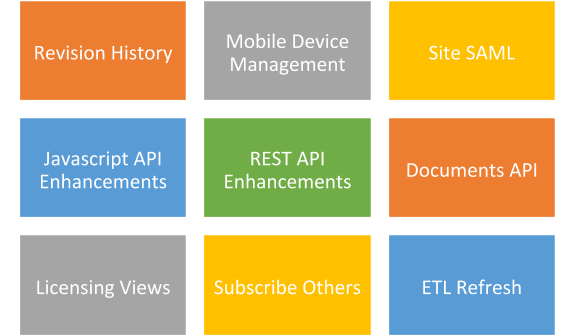 Server REST API - With Tableau server REST API, we can get programmatic access to all the functionalities behind any projects, data sources, workbooks, sites or site users on Tableau Server. “No-code” data queries - Yes, it is possible to query data source without performing a single line of code query in Tableau. Interactive dashboards - Tableau’s most highlighting feature is Interactive dashboards. It enables us to visualize our data , filter them on demand. Metadata management - Whatever we are adding manually on top of original things are called metadata. Tableau keeps track of all these metadata and makes everything in sync and consistent. Along with these key features, Tableau has some major important features embedded in Tableau 10. Tableau supports VMware Airwatch and MobileIron for mobile device management. So that we can deploy Tableau on mobile across organizations securely. Tableau server supports different SAML based identity providers on a per site basis. In Tableau 10, REST API is extended with more metadata information and user results filtering. In Tableau 10, a new document API was introduced which can give support to work with Tableau files such as .twb and .tds. This implies that we can create any template workbook and deploy that across the whole organization. Tableau has introduced a new feature where it has administration views which has details of licensing and usage of Tableau desktop. Once it is configured on Tableau Desktop, it will automatically send usage information to Tableau server every 8 hours. For this server login is not required. We can send subscription emails to users and allow others to subscribe to our dashboards just through a click. In Tableau 10, web data connector can be built powerful and flexible as this version is easier to use and supports multiple table joins. Web connector has enabled Tableau to refresh an external ETL job without touching the analysis of data flow. Why Tableau is the best reporting tool? Using Tableau, creating interactive dashboards is a simple and easy task anyone can do within minutes. There are so many variations available which we can use while creating dashboards which also restricts us from creating charts that are against data visualization practices. Tableau is basically a data visualization tool which can create stories through simple visualization. Through visualization, any complex thing can be easy to understand by clients. The same thing cannot be easily derived to clients by sharing a spreadsheet. Tableau has made data analysing easy, fast and beautiful. Users can select any visualization template from library or they can create their own custom one. Anyone unaware of Tableau’s visualizations capabilities? Check this out here. Managing executives of your company can be a cakewalk for you if you’re using Tableau. You can make any changes quickly and easily suggested by clients. These dashboards can be deployed at Tableau server and can be viewed on laptop, tablet or mobile. This is self-service analytics at its best. Tableau deals with both cloud-based and on-premise services. It solves customers’ business analytics problems by managing their data centrally. It can handle millions of sets of data with so much ease. Without affecting the performance of dashboards, various types of visualization can be created with a large quantity of data. Tableau also supports live connections to different data sources like SQL. Through live connections, Tableau provides real time data feeds to enterprise users. Tableau also provides support to 40 different data sources. Some are mentioned below. Through Tableau, we can easily connect with database views. It also helps us to optimize our queries’ performance. Moreover, Tableau has some very important inbuilt features like extract, transform and loading. Due to these features, we can modify data types, split or join data, concatenate data and also blend data etc. Furthermore, we can also create groups, sets or data bins. This implies that there is no need of any separate ETL tool to do so. Any person having some basic expertise can work with Tableau without any coding experience. No coding skill is required to work with Tableau. Almost all the functionalities are available through drag and drop. By using Tableau’s in-built calculations, we can easily add any complex analysis with just one click. Tableau also provides integrations with popular programming languages like R and Python which is a great help for data science field. Although Tableau is costlier than other BI tools in market, it has scored brownie points due to its great features and BI support. There is no hidden cost. Its basic pricing range starts with 35$ per user per month. Requirements also vary from company to company. Tableau has many solutions which can fulfil requirements from an individual user to large enterprise. For an individual user, Tableau Desktop is the solution for their needs. This tool helps an individual user to create data visualizations, publish data sources or workbooks to Tableau server. For small to large enterprises, Tableau server is used for fulfilling their BI requirements. This is an on-premise solution. This tool can take data from anywhere and share across organization through desktop or mobile browsers. There are also android and iPhone apps available to do so. As we have mentioned earlier, along with on premise Tableau also provides cloud-based services. Tableau Online is the platform hosted on cloud. It removed the need for IT infrastructure or support. There is no setup required as it is already set up on cloud. So, there is no need to setup and configure servers. Excel is a go-to tool for any business users for data analysing. That is a comfort zone for everyone analysing the data. Tableau performs exceptionally well while working with excel. 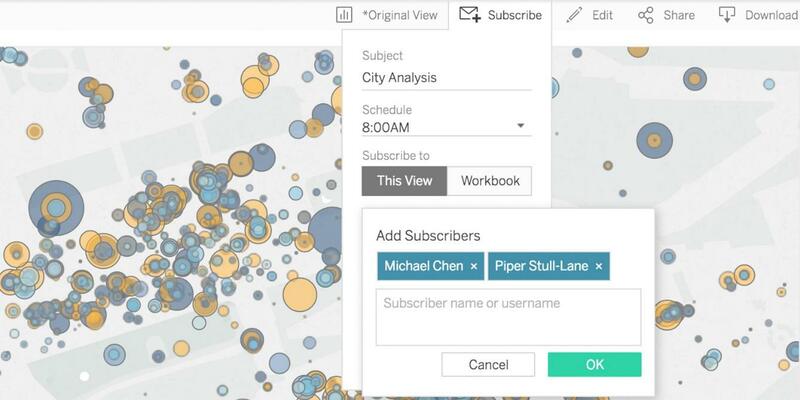 Tableau explores excel data faster and easier through drag and drop approach to visual analysis. Tableau visualizations are interactive and shareable which enables business to get required answers. We can combine Excel’s data collection and management capabilities with intuitive nature of Tableau and together they generate actionable insights from raw data. There is a large collection of resources like online guides, forums and trainings available everywhere on internet if you want to use Tableau. Along with this, there are various communities for Tableau available which can answer all of your questions. Tableau has its own community as well which is engaging and enthusiastic and can resolve any of the queries. Tableau has more than 50,000 happy customer accounts. It has covered almost all the possible industries like aerospace, automotive, banking, business and services, media and entertainment, communication, consumer services, education, retail and wholesale, financial services, Government. Travel and Hospitality etc. Below are the few companies using Tableau for their data visualization and analysis. Happy and satisfied customers base of Tableau keep tableau growing. 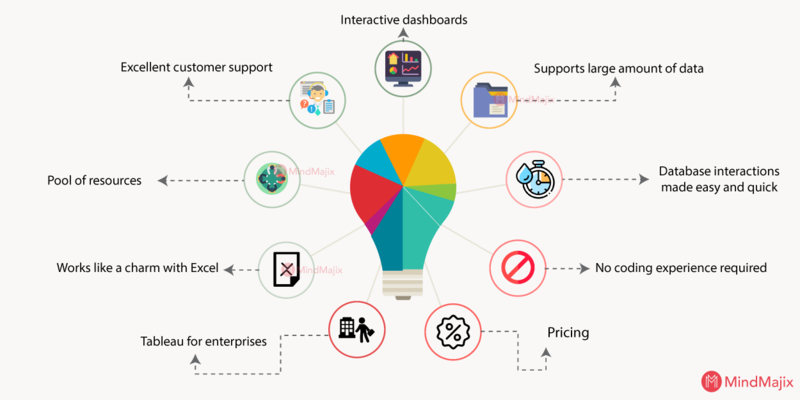 There is one factor which plays an important role to keep their customers happy and stick to Tableau, which is their customer support. Tableau customer support is considered as one of the best and trustworthy customer services provided by any BI tool. These are enough reasons for anyone to switch to Tableau for their business intelligence practices.